Harper wore this cute shirt to MDO today. This was a hand me down from another sweet Harper who was clearly a little smaller because this shirt just barely fit but I thought she had to wear it today anyway! ha! We are celebrating her birthday all weekend long! I can hardly believe this was her a year ago. She looks so tiny and sweet. I barely remember this age. Today while she was at MDO I cleaned house and worked on a few projects. I found this precious pink frame at an antique store in a booth two of my friends have. I finally ordered a picture for it and took it to Hobby Lobby to have it fixed up. It is so cute in Harper's room. By the way - can I ever completely express my love for Hobby Lobby? I love that they are a Christian company who plays Christian music in the stores and is closed on Sundays and I also love that nearly everything is always 50% off and they have the BEST stuff. Nobody asked me to say that - I'm just always impressed every time I go. My sweet lifelong friend Jamie who made the Ephesians 3:20 painting in Harper's room made me this bow holder for Hollis' room and I just got it in the mail! It is SO cute. She had made me one for Harper too. She is so talented. I had to get it hung up immediately! I can't wait to start putting bows on it. I can't believe I'm about to have two little girls I have to put bows on every day. I just wonder if Hollis will have blond or dark hair under her bows. I hope you have a great weekend! 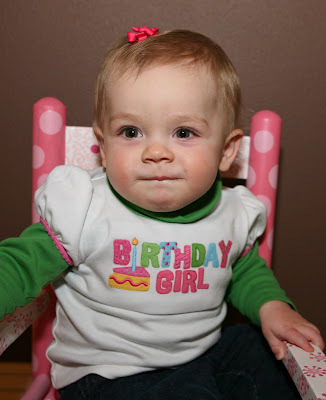 We will be enjoying our little girl and celebrating her two sweet years of life!